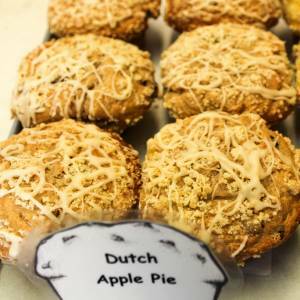 All the way from Holland this baked phenomenon of artistry and refinement is just as spectacular and time honored as the finest of Dutch works by Van Gogh, Vermeer, and Rimbrandt. When he originally created this muffin Frank called it the Rimmeergogh. But that’s obviously unpronounceable. But, if you can get any of your well mannered friends to talk with their mouthful about how finely conceptualized this muffin is, it’s likely to sound like Rimmeergogh!